Coal miners working the continuous-miner crew at Oxbow's Elk Creek mine in Somerset, Colorado. There are inherent dangers involved with mining, and people working in and around heavy machinery ranks amongst the leading causes of injuries and fatalities. With close range, confined areas and machinery travelling in reverse all proven to have the highest rate of accidents; Strata Worldwide’s HazardAvert has been designed to excel in these environments. 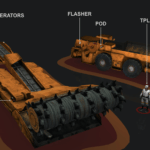 Of all the technology developed over mining’s history for safety, and even more specifically the safety of workers performing tasks around heavy machinery, one of the most recent globally is proximity detection systems. This still-rapidly evolving technology functions seamlessly in mines large or small, can be customised for any mine’s budget, and allows operations to focus on specific areas of concern. While the systems are still not required in some of the world’s mining operations, knowledge and understanding of the technology is no less vital. 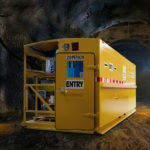 US-headquartered Strata Worldwide, with local offices in Newcastle, New South Wales, knows what a crucial role proximity detection plays in everyday mining, and has developed and enhanced its HazardAvert system for both coal and hard rock mines, underground and surface operations. The system promotes safer working practices, increased safety awareness, accident prevention and greater overall productivity. HazardAvert is an electromagnetic system for recognising both equipment and individual personnel in the ‘red zone’ around operating machinery. For vehicles that move between the surface and underground operations, HazardAvert offers continuous coverage without the need for user interaction. 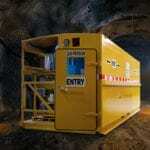 In underground coal applications, the system is housed in explosion-proof casings. In surface applications, the system includes front and rear cameras along with a graphical display screen located on the vehicle dash-board. The screen displays the camera views and a graphical representation of where other vehicles and/or pedestrians are located in relation to the vehicle. There are also differing audible alarms for warning and imminent danger alerts. With vehicle-to-vehicle detection, all operators are warned of potential danger and with vehicle-to-pedestrian detection, both the vehicle operator and the pedestrian are warned simultaneously. There’s no doubt that proximity detection technology has changed accident prevention for the better and the more effective the system, the greater the benefit. The Strata HazardAvert system prevents collisions and accidents by alerting machine operators and pedestrians of possible dangers, and has the capability to interlock into machine controls for autonomous movement prevention and emergency braking. With close range, confined areas and machinery traveling in reverse all proven to have the highest rate of accidents; HazardAvert has been designed to excel in these environments. In today’s data-driven industry, nearly every element of a mining operation can be analysed and studied to offer education to a mine on how things can be improved. A part of ensuring long-term mine safety is learning from mistakes, and HazardAvert has the ability to record and store interaction data. This includes alarms triggered, the individual(s) or vehicle(s) triggering the alarms, and the duration of time spent in direct danger. On demand, the system can produce reports for download and analysis, which can assist in both enforcing safer practices and used in new and refresher personnel training. The logged data can be transformed into reports for measuring productivity, analysing equipment operating status and maintenance patterns and even incident reporting. Berube adds that, when mines are working more safely, they are more efficient and more productive. For even more information on Strata’s HazardAvert system or to talk to a product specialist, please visit our website at www.strataworldwide.com or download the for below.